In the Ayurvedic system good health always begins with good digestion and lays emphasis on healthy, fresh, tasty and easy to digest foods. According to Ayurveda an incorrect diet can be the cause of virtually every condition and disease. In fact food is considered as natural medicine and a balanced diet the main resource for good health. Only then comes the supportive system of herbs, treatments and medicine. This approach differs considerably from the usual Western medicine that mainly relies on chemical remedies to “make” our bodies well as if to force nature to do our bidding. People are getting increasingly aware that those “quick fixes” might not be the best answer to their situations. The foods you eat affect your Doshas and their balance in your body and what will suit one person may well affect others differently. A good point to start with is to stick to a diet that favours foods soothing your dominant Dosha. However you don’t have to eliminate anything from your menu, Ayurveda is not about ridiculous dietary regimes, but about guiding principles: Just try eating a bit more of the foods that balance your dominant Dosha (or any other one that is temporarily overstimulated) and a bit less of the foods that don’t. At no cost start to feverishly avoid them – this will only increase your appetite for those foods and suppress the natural cravings of your body for it knows best what it needs at any given time. Food should be of good quality and pure, obtained from naturally grown products. Cooked food is considered as generally easier to digest than raw and should always be eaten in a calmly manner, not in a rush. Ayurveda promotes a diet with little meat or a vegetarian diet. Moreover, as foods closely connect with the Doshas, different sorts of food are required at different times, and should correlate to the time of the day, the season and your personal Dosha constellation; e.g. heavier food in winter and light choices in the evening. Spices also should be used in accordance with the time of the day (e.g. noon is dominated by Pitta) and your personal constitution. Ideal foods are considered “Tridoshic”, which means they keep a good balance of the three Doshas within themselves. For example Tumeric benefits all Doshas, cleaning toxins from the blood and aiding digestion. 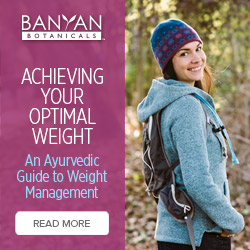 This results in a complex system that takes its time to master, but even some basic understanding of the Ayurvedic diet principles can help improving the one or other condition. eat according to the season, e.g. in general avoid cold, dry foods in winter and hot, pungent ones in summer; instead favourite the opposite for better balance but keep in mind your Dosha and go with intermediate choices if in doubt. Admittedly, this is a lot to digest at once (pun intended), so if your just starting with Ayurveda or Ayurvedic Diet, so why not read our Quick Step Guide how to get started with Ayurveda Diet?